As part of the Palace Group, Spin Palace Casino has been registered in the UK and licensed by the Lotteries and Gaming Authority of Malta since 2001. 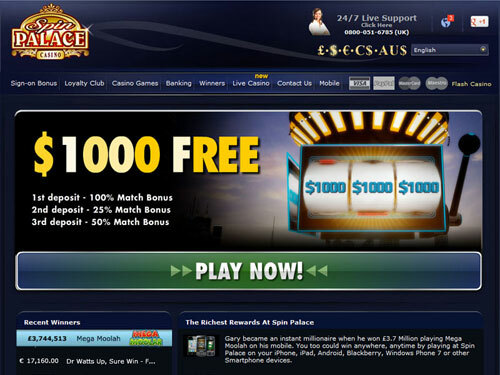 Since the site is powered by Microgaming’s elite Viper software, players are given an opportunity to play a wide range of games with exciting graphics and video features. The independent testing laboratories of eCOGRA have tested the software, giving it a rate of 97% and certifying the site’s games as “fair and safe” based on testing results. Spin Palace Casino uses bank-level 128-bit SSL encryption and firewall technology to protect player’s personal and banking transaction information. 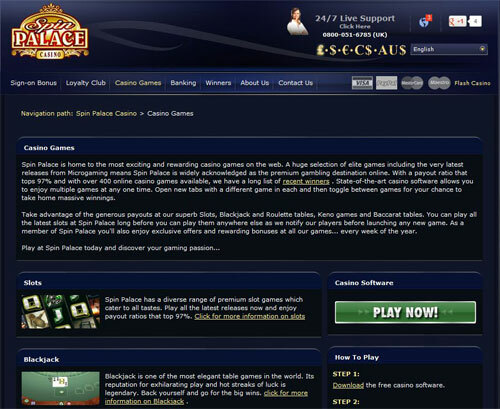 Spin Palace Casino offers players a very limited package of promotional bonuses. 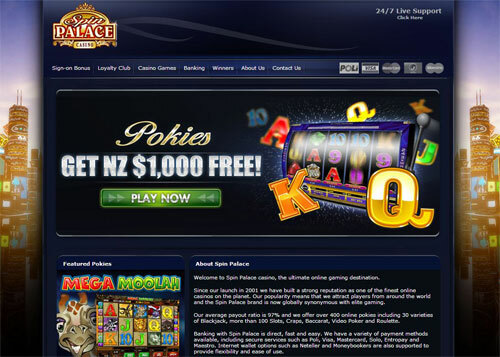 Welcome Bonus – Players can receive as much as NZ$1000 over the first three deposits. Deposits must begin within seven days of registration to be eligible. The minimum deposit each time is NZ$20 with a 100% match on the first deposit, 25% match on the second and a 50% match on the third. Comes with a 50X play through requirement. Loyalty and VIP Programmes– The six-tiered loyalty programme offers points based on the player’s level and games played. The Diamond and Prive levels are reserved for VIP members who can earn an exciting basket of extra benefits. Points are redeemable for cashback. The site provides the following banking options that are available to Canadian players; ClickandPay, Visa, Master Card, Ukash, Skrill, Instadebit, iDebit and bank transfers. Before withdrawals are processed, they require a pending period of 3-4 days and proof of identification. Spin Palace Casino offers 400+ of Microgaming’s most exciting and popular games. The games are accessible in instant play mode with web browsers, via mobile devices that use Android, Blackberry and iOS operating systems and download mode (PC only). Note: Games for instant play mode and mobile devices are limited. The following types of games are available; video slots, video poker, fruit machines, scratch cards, table games (roulette, Texas Hold’em poker, blackjack, etc.) and several “live dealer” games. The most popular games are “Terminator 2” (video slot), “Mega Moolah” (progressive video slot), “Major Millions” (progressive video slot), “The Dark Knight Rises” (video slot), “High Streak Blackjack” (table game), “Aces and Faces Power Poker” (video poker) and “Avalon II” (video slot).